Renold Gears has launched a new, high precision adjustment mechanism, Ren-Adjust, for dual lead gear sets used on positional machinery requiring a high degree of accuracy, such as rotary tables and machine tools. The new system for precisely adjusting backlash is quick and simple to operate, by comparison to alternative systems, reducing down time whenever an adjustment needs to be made. The new Ren-Adjust has been designed as a simple replacement on existing machinery and can also be specified by machine tool and rotary table manufacturers as a like-for-like component, in many cases with no need to modify existing designs. 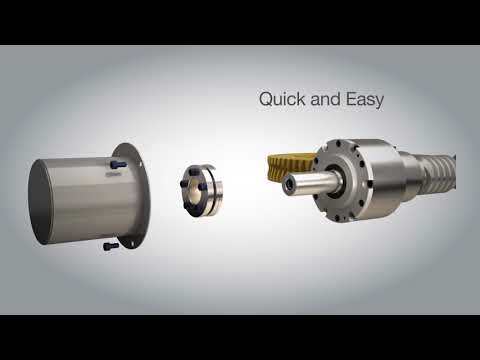 Renold's system can therefore replace that of most other manufacturers without any redesign or modifications. This makes it easy for OEMs to switch to the Renold product and equally simple for machine operators to replace their existing equipment. Ren-Adjust permits precise adjustment without the need to remove the wormshaft or drain oil. It is quick and easy to use and cuts adjustment time to a minimum. The backlash is adjusted by simply removing the shrink disc, which will allow the worm shaft to move independently from the adjustment sleeve, and by turning the captive screw, which will axially move the dual lead worm shaft and adjust the working backlash. Once the backlash is acceptable, the shrink disc is re-applied. The size range of the Ren-Adjust mechanism covers centre distances from 67 - 500mm.